Dores André and Solomon Golding in Annabelle Lopez Ochoa's "Guernica," via YouTube. In honor of its 85th anniversary, San Francisco Ballet has commissioned works from 12 internationally-recognized choreographers to contribute to the company's Unbound: A Festival of New Works, now in progress. Pointe spoke with Belgian-Colombian choreographer Annabelle Lopez Ochoa and corps member Solomon Golding about the process of making Guernica, Ochoa's work inspired by the painting of the same name by Pablo Picasso. As a piece of art, Picasso's Guernica is iconic for its portrayal of the terrors of war. What made you want to bring it to SFB audiences at this time? Annabelle Lopez Ochoa: I knew I wanted to use Picasso as a starting point. I'm a fan of cubism, I like seeing the face in geometric form. I had seen a video on CNN of a chemical attack on a Syrian village. Normally I would press the "stop" button. This time, I realized that I had a moral obligation to give it my full attention. I asked myself, "What can I do, as a human being and as an artist, to make it exist for a public that is as inclined as I am to press the stop button?" While I don't compare myself to him, Picasso had the same reaction, and created the painting Guernica. The village in Syria, like Guernica, is a place where few people go. It's not beautiful, and the painting is not meant to be beautiful. Can you talk about the music for this piece? ALO: It was about finding music that would fit the theme. Orchestra music is too pretty, so it is electronics with two solo instruments. The composers are Raime and Michel Banabila. It ends with a piano solo by Charles-Valentin Arkan. Its forcefulness creates a mood of violence for the dancers. 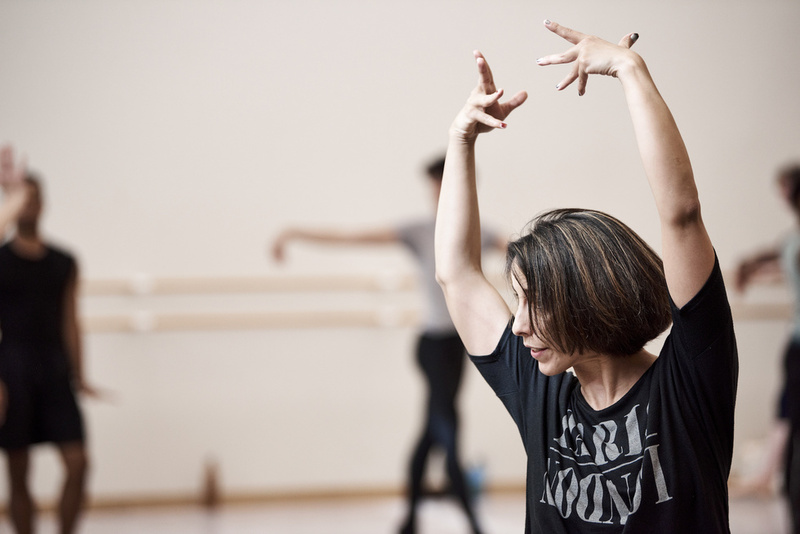 You are working with dancers who are in their early careers. What do you expect them to take away from this experience, and what will you take away from working with them, in terms of their generation's outlook? ALO: I don't see it from the perspective of what I expect from them. I am hoping that they too want to say something about these world events, and feel responsible for the message. Ballet is about grace and beauty, but also has the power to transmit a message. Solomon Golding: I have been working with so many different choreographers to prepare for Unbound, and each experience is so different. In Annabelle's case, it's a genuine collaboration, as opposed to others who come in with everything already set. We workshopped for a week, which I like. ALO: The dancers were preselected. There was no choice: "Here's the palette, here are your ingredients. Make something!" SG: We learned to create reciprocating levels of energy. The choreography is punchy immediately. It's rare to do classical with a level of attack done in this way. It took me beyond my normal boundaries, but I liked being comfortable with being uncomfortable. Anabelle Lopez Ochoa in rehearsal. Photo by Erik Tomasson, courtesy SFB. Solomon, what else distinguishes Annabelle from other choreographers you've worked with? SG: There's a level of respect coming from both choreographer and dancer. It makes our job so much easier. We are dancing aggressively six hours a day, but in the way that she works, with great empathy, there are no injuries! When a choreographer comes into a room offering respect, not judging anyone, taking a little longer to explain or demonstrate, that makes a big difference. ALO: I prefer to approach them with reinforcement. "Actually that looks better. . ." Also, I like to discard what doesn't work when they have a better idea, being flexible in order to create. I am working with 24 different personalities. You have to build your piece. I am not good at counts, so I delegate—one of them will do the counts. It gives you a chance to see who they are and to enhance everyone's strength. It's their piece. Picasso's Guernica has a certain historic legacy in the art world. Does that enliven the work with inspiration and at the same time imply a special burden of responsibility for the dancers? ALO: I'm not making a replica of the painting. It is my response, having studied the painting, studied Picasso. It's an ode to an artist. I secretly hope that the dancers will go on Wikipedia to research the painting. What is this artwork that we all know the name of? We have violence and we have beauty. How do you translate cubism into movement? The duets weren't looking cubist, so I'm doing four couples instead. I have to get it right, because I will never as long as I live do it again. Dores André in rehearsal for "Guernica." Photo by Erik Tomasson, Courtesy SFB. What do you find most challenging about the work? SG: It's so punchy, so dynamic, so it's about finding moments of light and shade. Doing it all high energy can end up flat-lining it. As in the painting when you look at it, its hexagonal, but then you see moments of tenderness, such as the crying mother. So you have to take care because it can end up being linear if you don't find light and shade. What message does Guernica convey? ALO: I'm ending the piece with a message that the bull is both victim and aggressor. Each of us has both an aggressive and peaceful aspect. For those who tip the balance toward aggression, we have to ask why. I followed the families who had been subjected to the chemical attack. There is a little girl wearing a Disney T-shirt. She put her doll in a box, and said to the doll, "You might get asphyxiated, but at least you won't see terror." The final pose is as in the painting, an embrace. Nashville Ballet's Kayla Rowser and Nicolas Scheuer in Swan Lake. Karyn Photography, Courtesy Nashville Ballet. Pre-professional ballet students know this to be true: Training comes first; everything else fits when—or if—it can. Are the sacrifices pre-professional ballet dancers make to pursue a highly competitive career worth it? Four professionals weigh in. From left: Elwince Magbitang and Raye Vince Pelegrin. Erica Wolf, courtesy Magbitang and Pelegrin. Training in Manila, Philippines may seem a world away from dancing with the big ballet companies in New York City. Yet in April 2018, local ballet students Elwince Magbitang and Raye Vince Pelegrin, both 17, shared the stage in Manila with leading dancers from American Ballet Theatre in the benefit gala An Intimate Evening with Stella Abrera & American Ballet Stars. Little did they expect that their performance as toreadors in the Don Quixote Suite would land them at ABT's prestigious Jacqueline Kennedy Onassis School. Magbitang (back left) and Pelegrin (front center) with JKO School students volunteering at the Family Friendly Matinee during ABT's Fall season at the Koch Theater. Photo courtesy Raye Vince Pelegrin. Broad as the Mat Hatter with his Alice, Orlando Ballet's Kate-Lynn Robichaux. Michael Cairns, Courtesy Orlando Ballet. Arcadian Broad has music in his mind. More and more, the Orlando Ballet leading dancer is making his mark behind the curtain—as a choreographer and composer. "I just hear things in my head that make sense for dance and music together," says Broad, who has no formal training in composition. "So I follow my instincts." Broad, 23, is creating Wonderland: Mad Tales of the Hatter, inspired by the familiar story of Alice and her trip down the rabbit hole. He's not only choreographing the full-length work for Orlando Ballet; he has composed the music and will dance the leading role of the Mad Hatter when the show opens April 26.